1. Food produced at company A’s factory gets contaminated and is distributed to grocery stores nationwide. 2. John buys the food and uses his store loyalty card when he checks out. 3. A few days after eating the food, John gets diarrhea, fever and stomach cramps. 4. John goes to his doctor, who collects a stool sample to test for germs. 5. The clinical lab finds the Salmonella germ and sends a sample of it to the state public health lab for further testing. 6. The state public health lab identifies the DNA fingerprint of the Salmonella germ from John and enters the results into the PulseNet database. 7. CDC’s PulseNet finds people in other states who got sick from Salmonella with the same DNA fingerprint. 8A. CDC contacts state health departments and starts a multistate outbreak investigation. 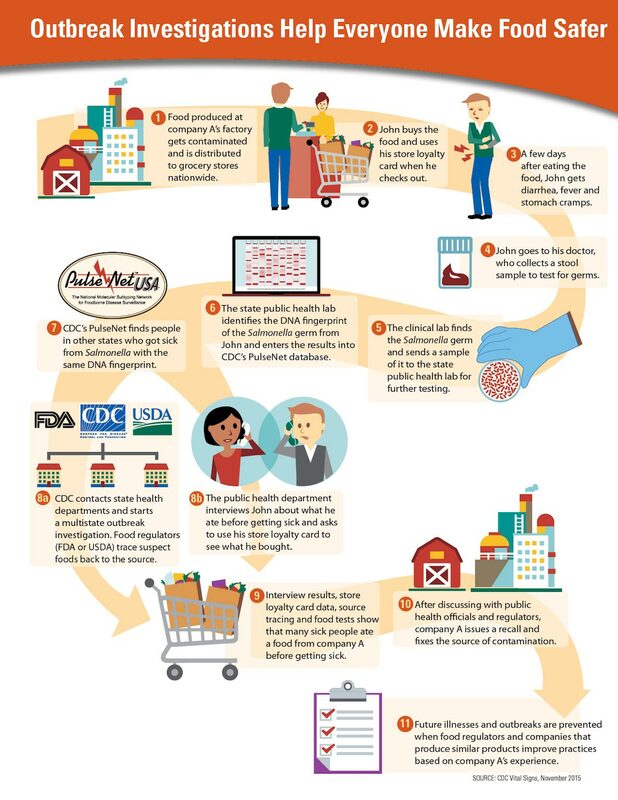 Food regulators (FDA or USDA) trace suspect foods back to the source. 8B. The public health department interviews John about what he ate before getting sick and asks to use his store loyalty card to see what he bought. 9. Interview results, store loyalty card data, source tracing and food tests show that many sick people ate a food from company A before getting sick. 10. After discussing with public health officials and regulators, company A issues a recall and fixes the source of contamination. 11. Future illnesses and outbreaks are prevented when food regulators and companies that produce similar products improve practices based on company A’s experience. SOURCE: CDC Vital Signs, November 2015. National Center for Emerging and Zoonotic Infectious Diseases (U.S.), Division of Foodborne, Waterborne, and Environmental Diseases.. Centers for Disease Control and Prevention (U.S.), Office of Surveillance, Epidemiology and Laboratory Services..